Lake Ellsworth is a subglacial lake under approximately 3.4 km of ice in West Antarctica, A subglacial lake is a lake under a glacier, typically an ice cap or ice sheet. Lake Ellsworth is approximately 10 km long and is estimated to be tens of meters in depth. It is strongly considered as a site for direct exploration due to the possibility that it may harbor unique life forms as well as its relatively easy accessibility. After being granted permission in March 2009 to study the lake by the Natural Environment Research Council, a team of four British engineers has returned to the UK after completing the gruelling journey. 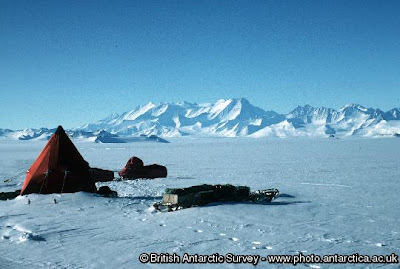 Lake Ellsworth is one of the most remote and hostile locations on the planet. The team's mission is to put in place equipment and supplies for an ambitious project later this year. Enduring temperatures of minus 35°C the Subglacial Lake Ellsworth 'Advance Party' has successfully paved the way to explore an ancient lake buried beneath 3 km of Antarctic ice. A powerful 'tractor-train' towed nearly 70 tonnes of equipment across Antarctica's ice over deep snow and steep mountain passes. In December a science and engineering team will make the 16,000 km journey from the UK to collect water and sediments from the buried lake. Lake Ellsworth will be the first Antarctic subglacial lake to be measured and sampled directly through the design and manufacture of space-industry standard 'clean technology'; the first of its kind to be developed. Scientists have been planning for more than 15 years to access the lake in the quest to yield new knowledge about the evolution of life on Earth and other planets. Lake-bed sediments could also provide vital clues about the Earth's past climate. Through a bore hole, drilled using high-pressure hot water, the team will lower a titanium probe to measure and sample the water, followed by a corer to extract sediment from the lake. The hot-water drill to create the borehole has been designed and built by engineers at British Antarctic Survey. Only two companies in the world could deliver a 3.4km-long continuous hose to the required specification – both based in the UK. The unique five metre long water sampling probe was designed and built by engineers at the National Oceanography Centre in Southampton. Made of the highest grade of titanium to ensure maximum sterility and strength, it will collect 24 water samples at different lake depths, including the top layer of sediments at the lake-floor / water interface. The Advance Party team paved the way for this mission by transporting the drilling equipment more than 250 km through the Ellsworth Mountain range, over deep-snow terrain and crevasses to the Lake Ellsworth drilling site. The final leg of this journey was the most challenging and required powerful tractors to tow heavy containers of equipment on sledges and skis, forming a 'tractor-train'. The soft, deep snow and concrete-hard 'sastrugi' snow forms caused the Advance Party's progress to slow, but after three days they safely reached the Lake Ellsworth drilling site. Andy Tait, Advance Party Member and Hot Water Drill Designer / Engineer says, "Lake Ellsworth is extremely remote, cold and hostile – ambient temperatures dropped to -35°C and with wind chill they dropped further still making living and working on site a physical challenge. We deliberately located the equipment over a kilometer (1.7km) from the drill site to protect it during the harsh Antarctic winter. We will move it to its final position and set up the rig ready for drilling in December. "Severe winds and the extreme environmental conditions of the area made it vital that we spent a number of days winterising the equipment. 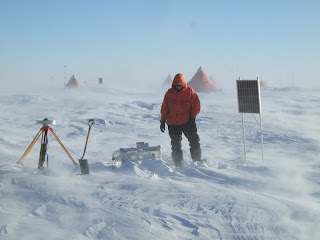 Windblown snow will partially bury the equipment and this area of Antarctica is so vast that it would be difficult to find it again without the GPS locators we fitted at the corners of the site. Going back to live there for three months in November will certainly be an experience!" Chris Hill, Advance Party Member and Lake Ellsworth Programme Manager says, "This is a major milestone for the programme and we are delighted that our complex logistical operations were a success this season. Working within the short Antarctic summer season adds pressure to our time on the continent, which is why we had to plan two stages of the programme. The drilling season is nearly upon us, and we still have a long way to go before we can access Lake Ellsworth, but the success of the Advance Party this season certainly puts us in a good position for November." The Lake Ellsworth Programme Principal Investigator, Professor Martin Siegert from the University of Edinburgh says, "The completion of this stage of the mission is a welcome one – we are now one step closer to finding out if new and unique forms of microbial life could have evolved in this environment. The samples we hope to capture from Lake Ellsworth will be hugely valuable to the scientific community. This year we will complete and test both the water sampling probe and the sediment corer. Extracted sediment samples could give us an important insight in to the ancient history of the West Antarctic Ice Sheet, including past collapse, which would have implications for future sea level rise." The Lake Ellsworth consortium has published a paper describing how the sampling of Lake Ellsworth can be undertaken with minimal environmental impact - Reviews of Geophysics: Clean access, measurement, and sampling of Ellsworth Subglacial Lake: A method for exploring deep Antarctic subglacial lake environments.